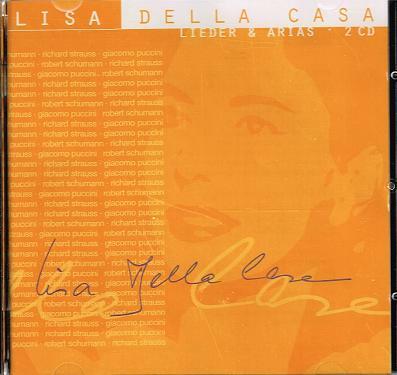 “Lisa Della Casa, the Swiss soprano who combined an outstanding voice, stunning beauty and exceptional stage presence to become one of the foremost interpreters of Richard Strauss, was one of a generation of sopranos to emerge from war-shattered Europe in the 1940s. 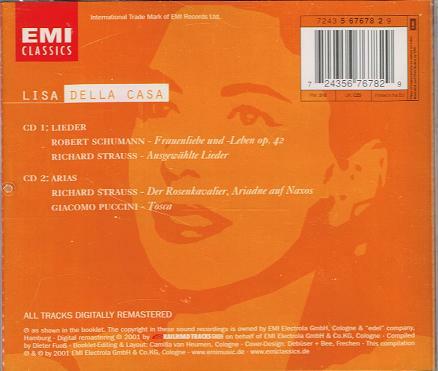 In her Strauss roles, like the title character of Arabella, which alternately calls for demure graciousness and soaring enthusiasm, Ms. Della Casa displayed ‘a wholly appealing kind of fragility, tender and unmannered’, the musicologist J. B. Steane wrote in his book THE GRAND TRADITION: 70 Years of Singing on Record. She was equally extolled for her roles in Mozart operas. In Europe, where Ms. Della Casa performed at the major opera houses, her beauty and charisma could seduce even a great conductor like Herbert von Karajan into pursuing her for roles that were out of her vocal range. ‘Karajan saw me as the Marschallin and, if you can believe it, immediately asked me to sing TANNHÄUSER with him’, even though the role, Venus, called for a dramatic soprano or a mezzo with an upper register and thus was not at all appropriate for her voice, she said in an interview in Lanfranco Rasponi’s book THE LAST PRIMA DONNAS. ‘He told me I had just the right kind of sexiness to make a splendid goddess of love’. She turned down the role. Her complaint was the opposite at the Metropolitan Opera, where, she said, the general manager Rudolf Bing typecast her. She sang four roles at the Met — Countess Almaviva, Donna Elvira, the Marschallin and Arabella — a total of 114 times in her 147 performances. ‘My 15 seasons at the Metropolitan were not happy ones’, Ms. Della Casa told Mr. Rasponi. ‘Mr. Bing would not have it any other way, for he kept repeating that I was indispensable for the Mozart and Strauss operas, and that he had a surplus of sopranos for the Italian and French ones’. Yet Ms. Della Casa rarely bickered or engaged in offstage dramatics. In an opera world notorious for outsize egos and histrionic rivalries, her colleagues openly admired her. The Romanian soprano Maria Cebotari, famous for her portrayal of Arabella in the 1940s, lobbied for the young Ms. Della Casa to sing alongside her in the role of Zdenka. ‘I’ll put my hand in the fire for her’, Ms. Cebotari told a Vienna opera manager who was skeptical of this relatively unknown soprano’s talent. Ms. Della Casa was also admired for her glamorous good looks. The German soprano Anneliese Rothenberger compared her to Elizabeth Taylor. Still, at 55 and at the height of her career, she abruptly announced her retirement in 1974 after singing her last Arabella at the Vienna State Opera. She then retreated with her husband, Dragan Debeljevic, and their daughter, Vesna, who was often in poor health, to their castle near Lake Constance in Switzerland. She offered no public explanations, nor was she ever tempted into recitals or master classes. 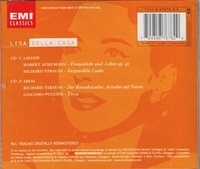 Ms. Della Casa appeared first at the Salzburg Festival in 1947 as Zdenka in ARABELLA; after hearing her premiere performance, Richard Strauss himself asserted, ‘The little Della Casa will one day be Arabella!’ In the fall of 1947 she made her début as Gilda in Verdi’s RIGOLETTO at the Vienna State Opera, where she remained an ensemble member for 27 years. In 1953 Ms. Della Casa made her début as the Countess Almaviva at the Metropolitan Opera, where she continued to perform until 1968. Her early Met performances as Donna Elvira and Madama Butterfly did not impress the New York critics. But she hit her stride with Arabella. ‘There was a youth in her movement and a beauty in her appearance that might well have driven Vienna’s gay blades wild', Howard Taubman of The New York Times wrote in 1957. ‘And her singing was unfailingly lovely — accurate, well focused and sensitively phrased’. "Anneliese Rothenberger had a light, lyric soprano that was well produced, smooth and beautiful; she was an attractive singer as well as a fine actress. She was a regular member of the Dresden, Vienna, and Munich operas for many years; her guest appearances at the Met were all too few."